Last month Ikea issued a massive recall of over 29 million dressers after reports of six child deaths and 36 injuries. The dressers can easily tip over and crush of suffocate children. 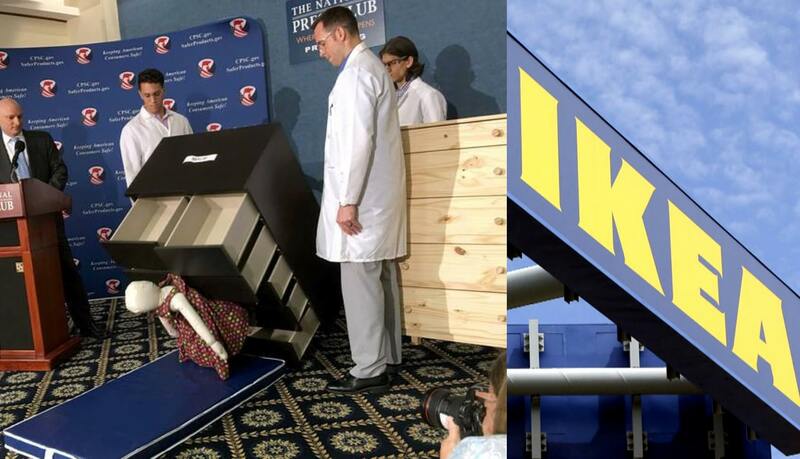 Ikea officials say they have done everything possible to prevent the injuries including warning consumers about the dangers and distributing 300,000 wall-anchoring kits to prevent dressers from tipping. But with the continual stream of injuries and deaths, the company finally decided to remove the dressers from the market. The problem of tip-furniture accidents extends far beyond Ikea furniture. On average, one child dies every two weeks from a furniture tip-over accident. Seemingly safe furniture can become deadly when a small child climbs on the furniture, often to reach for something on top, and creates a weight disturbance that causes the heavy furniture to tip. While some children walk away with minor injuries, many are crush or suffocated to death under the heavy furniture. Since 2002, the Consumer Product Safety Commission has reported 36 injuries to children from tipped over Ikea furniture, and 6 deaths. Over 80% of all child injuries from furniture-tip accidents occur in children ages 1 to 5. The most common tip-accidents involve televisions falling from the furniture. Officials believe there are many more incidents that are not reported. Most recently, a 22-month-old in Minneapolis was killed in February of this year when a drawer tipped and fell on him. We often think that well-made furniture should not be able to tip and fall from the small weight of a toddler, but many furniture items are made with particle board and other cheap materials that make the furniture lighter and more able to tip. Anti-tip devices can be installed on all furniture to prevent injuries to children. These devices use a thin wire to attach the furniture to the wall behind. Jaquelyn Collas, the mother of a two-year-old that was killed from an Ikea Malm dresser tipping, said she was not made aware that she needed to bolt the furniture to the wall. Collas believed that furniture should not need such precautions if made safely. The Ikea recall went into effect on June 28th, and includes six types of dressers that were made between 2002 and 2016. Ikea consumers can get free anti-tip devices at Ikea locations, but kits for these devices can also be purchased for $5 to $25. Children are not the only ones affected by top-heavy furniture injuries. Furniture-tip accidents; many types of furniture can cause serious tipping injuries. Earlier this month, a woman in Philadelphia was injured when the mirror of her daughter’s new dresser fell and struck her, causing neck and back injuries. Though the family had paid for the furniture to be delivered and assembled, workers had used fewer screws than necessary to secure the mirror, causing an imbalance. If you or a loved one has suffered an injury from unstable furniture, you may be eligible for compensation. Call our offices today for a free consultation with a NH Personal Injury Lawyer.